The award-winning fantasy/horror story hailed by critics as ‘A modern Narnia meets Stephen King’ is now an unparalleled audiobook experience! Written by Brooke Burgess, narrated by David Kaye, with music and audio production by tobias tinker. 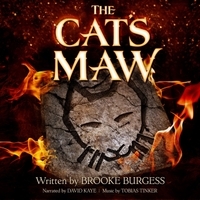 The award-winning fantasy/horror THE CAT'S MAW is reborn as an amazing audiobook adventure for brave young listeners, mystery lovers, and cat worshippers of all ages! Painstakingly crafted over 18 months on three continents, author/producer Brooke Burgess (Broken Saints, OZ: Broken Kingdom) fuses the virtuosic performance of David Kaye (Ratchet & Clank, Pixar's UP, Transformers) with a moving score by acclaimed composer Tobias Tinker (Broken Saints, Stillness3) for an unparalleled audio experience! Turn down the lights, turn up the sound, and enter the world of Billy Brahm -- a troubled boy, hoping to lift a terrible curse with the help of a mystical cat, calling to him from his nightmares! Lose yourself in this haunting, gripping, and bittersweet fable that VOYA Magazine calls: 'A Top Shelf 2015 Honoree -- Narnia meets Stephen King'!